The Hibernate Many-To-Many Unidirectional Mapping Example tutorial shows you how to use Hibernate Many-To-Many Unidirectional mapping using annotation based configuration. In Many-To-Many relationship, an intermediate table is added and it is known as Joined table. Its primary key is the combination of primary key of both the associated tables. 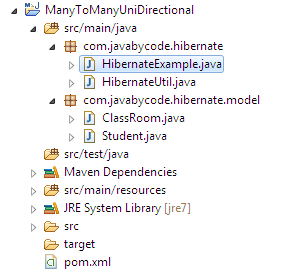 We will create main class to demonstrate this Hibernate Many-To-Many Unidirectional Mapping Example. That’s all on the Hibernate Many-To-Many Unidirectional Mapping Example tutorial.